The first great producer in rock ‘n’ roll, Maxwell Davis also had a modest career as a solo artist during his most prolific stretch behind the board in the late 1940’s and early to mid 1950’s as a tenor saxophonist but any records released under his own name were bound to be lost in the shadows of his prolific work as a songwriter, arranger, session musician and producer behind a litany of bigger names. Davis was born in Kansas in 1916 and by eight started his musical education on the violin and then later played piano in local bands while in school. At twenty one years of age Davis moved to Los Angeles where he began his career in earnest, playing saxophone for some of the biggest jazz and upscale blues bands in existence, among them Fletcher Henderson’s band and later for Jay McShann. Unlike many of his contemporaries who were tied to a certain sound Davis’s versatility on his instrument proved to be his entry into a much larger career than previously imagined. With the advent of scores of small independent labels in Los Angeles during the 1940’s, most of which were focused on black music styles, jazz, blues, gospel and by 1947 rock ‘n’ roll, these companies needed competent musicians who could play in any of these styles behind whatever artist was slated for recording sessions that week. Davis began getting as much work as he could handle, among them blues singer Jimmy Witherspoon whom he’d played with when both were associated with McShann’s group. This quickly led to expanded duties when these record companies saw Davis had the ability to not only play his own instrument on their sessions but could arrange for the entire studio band. The more responsibility he was given, the more successful the artists became. His most iconic work came with Amos Milburn whose work with Davis on the Aladdin label elevated him to a position of the most successful rock star of the late 1940’s and early 1950’s. The two had almost a telepathic connection musically, with Amos frequently calling out mid-song “Maxwell” which would then lead to a sultry Davis solo on sax. Davis wasn’t tied to any one company during this period and all of the L.A. based labels brought him in to handle their sessions, making him the de facto producer in an era where that word was only beginning to be used to define the role that Davis himself had helped to spearhead. He wrote songs in a myriad of styles to suit whichever artist he was paired with, from Etta James to aggressive blues-rocker Johnny “Guitar” Watson to female doo-wop group The Teen Queens. Blues legend B.B. King called him the best writer ever and it was Davis who oversaw King’s most successful run in the 1950’s, finally giving King the expansive big band sound the singer craved without diluting the pure blues song structure and feeling. 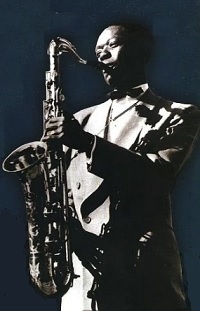 Davis’s greatest attribute may have been his musical instincts and a willingness to deviate from planned arrangements for something conceived on the studio floor, no matter the hassle or cost incurred, something seen when he scrapped the expensive 16 piece band used on the first run-through of Peppermint Harris’s “I Got Loaded” in favor of just using a basic four piece group which altered the entire feel and turned the song into #1 hit. By 1954 he was employed exclusively by Modern Records which diluted the sheer number of acts he could work with and with the commercial center of rock increasingly focused in the East as the music crossed into the white mainstream, the West Coast-based Davis met with diminished returns as the decade wore on. Throughout all of this work behind the scenes for others Davis recorded sax instrumentals for a variety of labels without scoring a national hit, but that lack of official acclaim is no indication of his ability. He played on such a huge number of hits spanning a full decade that his horn certainly was one of the most omnipresent sounds in early rock ‘n’ roll. More than that however it was Maxwell Davis as much as any other figure who helped to give shape to the music as the preeminent producer of the initial rock era.